Canker sores are a fairly common problem that many children (and adults!) suffer from occasionally. They can be painful and can make it more difficult to eat or drink. Here’s some useful information on canker sores; what exactly they are, what causes them, and what to do when your child gets a canker sore. A canker sore is a mouth ulcer or sore that’s open and can be quite painful. They’re the most common type of mouth ulcer found in both children and adults. Some people notice them on the inside of their lip or cheek. They’re usually white or yellow and surrounded by red, inflamed soft tissue “halo.” They usually heal on their own within one to three weeks, although the pain normally subsides in seven to ten days. What causes canker sores in children? Doctors are unsure what exactly causes canker sores, but there are several contributing factors that may trigger the onset of a canker sore, including diet, mouth trauma, stress, nutritional deficiencies such as folic acid, vitamin B12 and iron, infection or allergies. Canker sores appear more often in children with weak or over active immune systems, but appear in children with normal immune systems as well. Typically, there’s no identifiable cause for a canker sore when a child gets one, and almost every child will experience a canker sore at some point. Throughout my years of practice, I have noticed that a common ingredient in toothpastes called Sodium Lauryl Sulfate (SLS) seems to be the culprit in causing canker sores. While there is no conclusive evidence to support this theory (besides my personal chair-side experience), there is sufficient evidence to support the theory that SLS can inflame an existing canker sore problem. I have recommended that my patients try a type of toothpaste that doesn’t contain SLS like Jason Sea Fresh, Squiggle Enamel Saver, Sensodyne ProNamel, Kiss My Face, Auromere, Baby Bling. The issue with some of the brands of toothpaste previously named, is that they do not contain fluoride, so not one toothpaste is perfect. My own mother switched to the AquaFresh Sensitive Toothpaste, which does contain MINIMAL amount of SLS and her canker sores have practically disappeared. 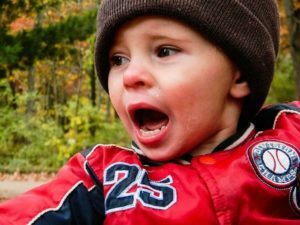 There are often symptoms before a canker sore erupts, but they can be so slight that many children never even notice them until a canker sore forms. Some kids may notice a tingling or burning sensation a day or two before the sores actually appear. Most canker sores are round or oval in shape with a white or yellow center and a red border. They typically form on or under the tongue, inside cheeks or lips, or at the base of gums. Parents may not even be aware that a child has a canker sore until the child refuses to eat or drink, brush their teeth, or complains of mouth pain. Toddlers and young children may refuse to eat because of the pain and irritation. In some cases, they may have fever, or complain of feeling tired or ill. If your child has a canker sore, ask your pediatric dentist about relieving pain with acetaminophen or ibuprofen. Make sure your child avoids acidic, spicy, or salty foods or drinks, such as orange juice or tomato sauce. Also avoid rough-edged foods such as chips that may scratch and irritate the sore. To relieve the pain, you can place an ice cube against the sore, or try a popsicle or frozen juice bar (avoid orange juice bars!) to help relieve pain. When the pain is severe and your child refuses to eat or drink, these frozen bars can provide necessary hydration. There are also anesthetic ointments or gels that may be used, but consult your doctor or pediatric dentist first. Magic mouthwash can be prescribed to help numb the area, or you can purchase an oral wound care dressing called Sockit! – I LOVE THIS STUFF! It’s difficult to avoid canker sores altogether, but there are a few things you can do to lessen the chance of your child getting one. Buy your child a soft-bristled toothbrush, and make sure they’re brushing at least twice each day. Try using toothpaste that doesn’t contain sodium lauryl sulfate, which some dentists suspect promotes sores. If your child has braces or other dental appliances, ask your pediatric dentist about special wax to cover sharp or rough edges. Allergies may also cause canker sores, so if your child is allergic to certain foods, help them avoid those foods whenever possible. Canker sores usually go away on their own and don’t occur often. However, if your child has a sore that lasts more than two weeks, experiences difficulty swallowing, develops of fever, or if the canker sore becomes unusually inflamed and painful, make an appointment with a doctor to make sure there are no other underlying causes of the canker sore. Canker sores are painful, so the more you understand about what to do when your child gets a canker sore, the sooner your child will be back on the road to happy, healthy, pain-free mouth.